I’m on a road trip and writing this from just south of the Houston Space Center (more on that in a future column). 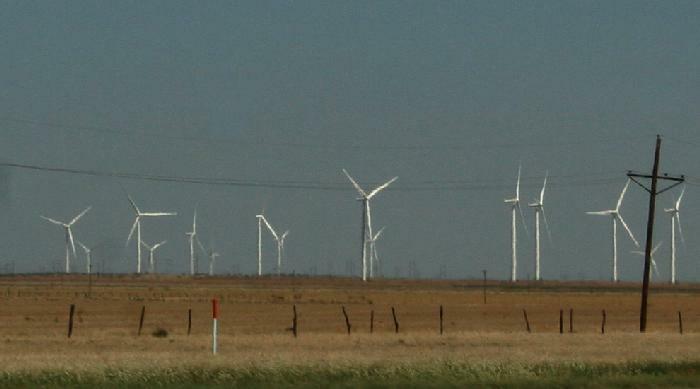 As I drove through North Texas I saw the largest wind farm I’ve ever seen, and I’ve seen more than a few. This is the Wildorado Wind Ranch, located 25 miles east of Amarillo, TX north of I-40. It comprises 70 Siemens Mk II turbines, each capable of generating 2.3 MW of power at peak wind speeds. The entire system produces 161 MW, enough to serve 50,000 homes. Only 15 of the 70 turbines are visible in this photo. Those are some impressive specs, and it’s great to see such a huge commitment to renewable energy, but what I found interesting was how the wind turbines were facing in different directions. One would think that, in a large flat open space like this, the wind would be blowing uniformly in the same direction. But you can see from the photo that the turbines have self-oriented in different directions. And they were all spinning … none were “idled” for service or repair. This is a result of what meteorologists call the curl and divergence of the wind vector field. I try to keep Sky Lights simple, but need to provide a brief math lesson today. Are you ready? A map of all the winds in an area constitutes what is called a vector field. At every point, the wind has both a direction and a magnitude (speed). Same thing with ocean currents and traffic patterns. When you consider a wind map for the entire surface of Earth, it is mathematically impossible for the wind to be blowing in the same direction and speed at every point. There must be places where it’s calm, and other places where the direction changes. It’s a necessary consequence of mapping a vector field over a closed spherical surface, not to mention the effects of topographic barriers like mountains. I just never thought about the scale of that effect, but it’s clearly visible here. You can view a live feed of the current wind vector field around our planet. Check out this beautiful animated and interactive graphic at: https://earth.nullschool.net/. Drag the Earth around to see wind flow patterns on any part of its surface. If the wind is blowing in the same direction over a given (limited) area, both the curl and divergence = zero. If the wind direction is changing (curl) or spreading out (divergence), those values are non-zero. This wind farm covers some 16,000 acres, and apparently that’s sufficient area for the curl to be significant, and the wind direction to change. What causes the curl is micro-meteorological effects: small changes in topography, the “wind shadow” of individual turbines creating turbulence, and shear between different layers of air at different altitudes. I don’t notice this in my back yard, which is far smaller than 16,000 acres. As I walk around my yard, a north wind remains a north wind. But over a larger area like this, curl and/or divergence can happen. The varying turbine orientations are visual proof.